TRAC Research: Surface Disinfection: Can it be effective, safe, and easy? 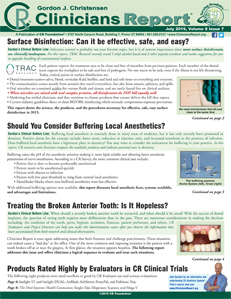 Should You Consider Buffering Local Anesthetics? Treating the Broken Anterior Tooth: Is It Hopeless? • How can clinicians tell which surface disinfectants kill well? • Do all surface disinfectants kill pathogens equally well? • There are many products named Lysol, so how do I know which one to buy and the best place to buy it? • Why do speakers and/or authors tell me not to use ethyl alcohol (also called ethanol) for surface disinfection? • Can Lysol Spray III and GermXtra be used to disinfect all types of surfaces?